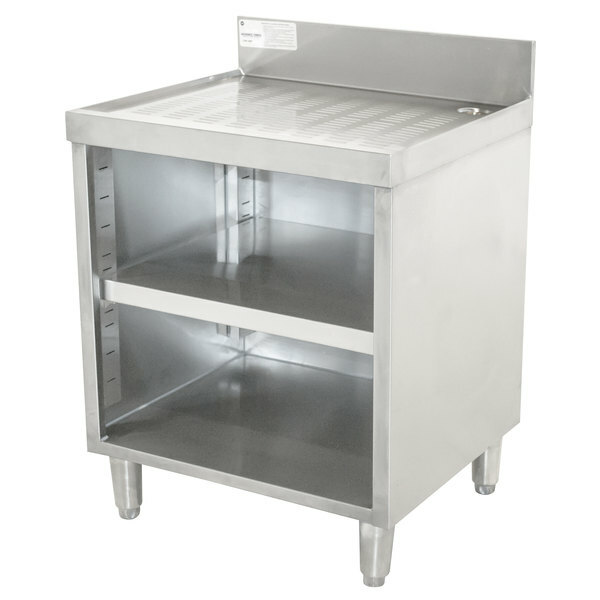 Advance Tabco CRD-2BM Stainless Steel Drainboard Storage Cabinet with Open Front and Mid-Shelf - 24" x 21"
Make the most out the limited space in your operation with this innovative Advance Tabco CRD-2BM stainless steel drainboard storage cabinet with an open front base and mid-shelf. An embossed and seamless drainboard is fitted with a 1" IPS drain in the back right along with a 3" diameter hole in the back panel for plumbing access. A 4" backsplash works to protect nearby walls and furniture, while a rear deck provides extra storage. The perfect accessory for storing, drying, and prepping your signature drinks, this Advance Tabco CRD-2BM drainboard will serve as a welcome addition to your commercial bar or restaurant. Overall User Rating: Advance Tabco CRD-2BM Stainless Steel Drainboard Storage Cabinet with Open Front and Mid-Shelf - 24" x 21"